This Cork Board Streamlines Your Class or Conference Room Presentation! This Cork Board Has Industrial Style! 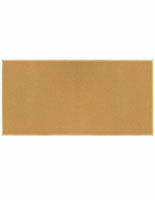 CorkBoards2Go.com Stocks Wall Displays Online! Common Size: 144" x 48"
36" x 24" 48" x 36" 60" x 48" 72" x 48" 96" x 48" 120" x 48"
Board of porcelain-on-steel is magnetic to hang posters, magnets and more. Tray has protective end caps to keep markers and erasers from sliding. Made from tough material to resist most types of damage. 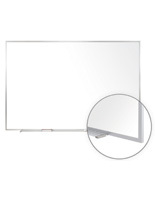 The large size (12'w x 4'h) of this specific magnetic white board suits a classroom setting rather well, giving plenteous room to teach lessons. These cork boards are perfect magnetic white boards to have in a conference room to optimize presentation options. This cork board, magnetic white board comes with (1) black dry erase marker and an eraser for supplemental expediency. Use this magnetic white board in your classroom now. 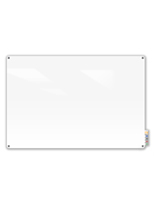 Conference rooms & classrooms alike will discover this cork board, magnetic white board effectual. 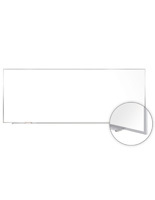 This magnetic white board, likewise recognized as a dry erase board, is produced from porcelain on steel. 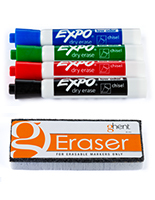 Caused by this, the dry erase boards, cork boards, and other magnetic white boards hold up against scratching, denting, and staining. This magnetic white board incorporates an aluminum frame, permitting it to appearance outstanding in any setting. Since it's magnetic, this cork board, magnetic white board works well for hanging posters to accentuate points in the course of a presentation or lecture.